Tennis legends John McEnroe, Patrick McEnroe, Chris Evert, Mats Wilander, Pat Cash, stage, screen and television actress Jane Krakowski, and nearly 200 other tennis pros, amateurs, enthusiasts and spectators attended the Johnny Mac Tennis Project’s (JMTP) Third Annual JMTP Pro Am—one of largest Pro Ams in the world—in the Hamptons on Saturday, August 26. Under sunny skies, the sold out, star-studded event—which has quickly become the premiere Pro Am in the Hamptons—raised more than $300,000 to support JMTP programs, including more than $100,000 raised at an evening auction. Illustrated by a moving video that launched the event under a tent on the grounds of SPORTIME Amagansett, the JMTP provides scholarships that change young lives by removing the economic and social barriers to success through tennis. The annual Pro Am—held at SPORTIME Amagansett in East Hampton—drew young and old amateur players excited to compete with top talent and alongside legendary tennis pros in a memorable afternoon of doubles matches. 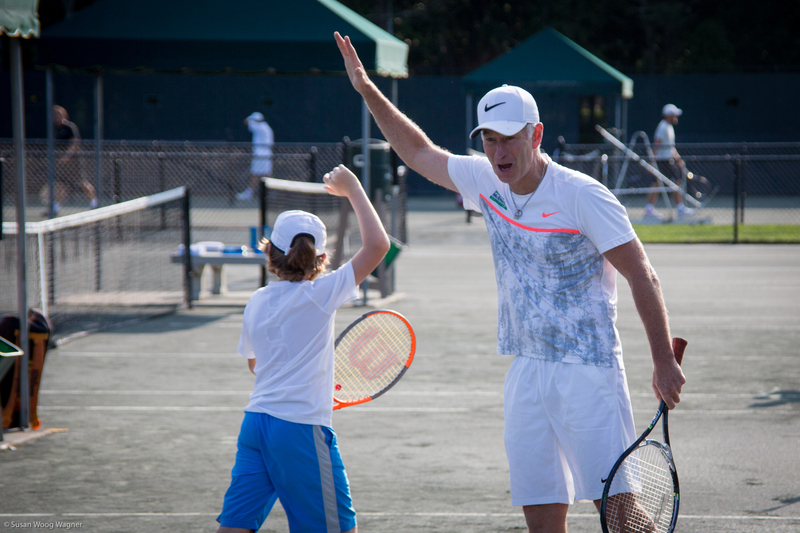 Participants competed in a round-robin doubles tournament alongside former WTA and ATP World Tour professionals, current and former Division I College players, and top John McEnroe Tennis Academy pros. In total, 64 professional players were partnered with 64 amateurs—as about 75 spectators cheered them on—and at the end of the day, Mike Williams and Francisco Diaz, were crowned the winners. The Pro Am included an exclusive Benefactor Level, in which eight lucky amateurs competed with and against the tennis legends and current and former ATP and WTA touring athletes. Throughout the day, enthusiasts cheered as they watched the series of matches, mingled with tennis legends, dined on wine and appetizers, and bid on silent auction items. JMTP’s Pro Am in the Hamptons sponsors included: Bird in Hand, Hamptons Magazine, HEAD Penn, Nike, Polar Beverage, and SPORTIME/John McEnroe Tennis Academy. Immediately afterwards was an After Party under a star-filled sky, where players, guests and fans enjoyed hors d’oeuvres, a buffet dinner, an open bar, entertainment, dancing, and a live auction. Attendees also bid on vacation stays, US Open experiences, sports memorabilia, photographs and Sports Illustrated covers autographed by tennis legends, and dining experiences.